The production designer plays a vital role in creating real or imagined worlds on the screen. This course develops individual creativity and teaches technical skills essential for a career in film and television. “The NFTS remains one of the richest seams of creative talent and ideas under one roof.” Paul Kirby, production designer on Captain Phillips, Bastille Day and Kingsman: The Secret Service. The NFTS Production Design department is a fully equipped design studio, with students designing for live action shoots, using traditional and digital design techniques. They will collaborate with those in other specialisms to make several films and practical projects – with all production costs met by the School. Uniquely in the UK, our MA Production Design students study alongside students of other filmmaking disciplines, engaging in a series of productions where working methods replicate professional practice. The advent of digital technology has brought in new design tools and ways of working and this course promotes a lively interface between old and new methods. 3D and 2D computer techniques and Concept Art are taught alongside traditional skills such as set sketching, orthographic draughting, design geometry and model-making. 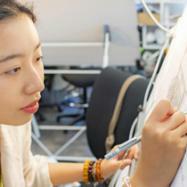 The course offers the opportunity to specialise in Concept Art, particularly in the second year. Design students apply their skills to live action and animation films, television programmes, games and commercials, in the studio and on location, using built sets and green screen. Relevant business and management skills are also taught, equipping students to manage a small art department, its budget, personnel and logistical schedules, studio procedures and set decorating. Studio visits and placements familiarise students with a working art department and inspire them with actual film sets. Production costs are included in the course fees, including the use of School facilities and equipment. Students are expected to provide their own laptops and to pay for their travel for occasional off-campus events and, if required, for specialised materials and drawing equipment. Production Design students come from a wide variety of visual backgrounds, including theatre, architecture, illustration, fine art, digital design, interior design and 3D design. Your portfolio submission must demonstrate a strong visual imagination, an aptitude for spatial and 3D design, an awareness of architecture and design for the moving image and exhibit a personal visual language. Please refer to our guidance notes here for more information. Experience of film/TV work is not essential but a willingness to work collaboratively and an ability to motivate and lead a team are essential. A comprehensive portfolio of work which demonstrates an aptitude for spatial and 3D design, awareness of architecture, design for the moving image and a personal visual language. Please submit a hard copy portfolio, which can be A4, A3, A2, A1. If you have any questions regarding the content, format or amount of work to submit, please contact the Production Design department at the NFTS or Registry.